In the year 43 Roman troops arrived in Britain with instructions to subdue the tribes and to bring the island into the Roman Empire. So smoothly did this conquest progress that soon the Emperor Claudius himself arrived in Britain. He accepted the surrender of the tribal chiefs and established a Roman colony at Camulodunum. Meanwhile, a small settlement called Londinium came into being on the banks of the Tamesis river. Around the military camp protecting its bridge, traders began to gather. Soon, as a consequence of the growth of trade, this settlement grew in importance. 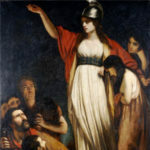 But then Boudica arrived with her tribes and burned the place to the ground. From those ashes London rose again, growing to become the capital of the Roman province of Britannia. This tour recreates the atmosphere of Roman London as it rose to its position of glory. Under Claudius Londinium had no status. When Hadrian arrived in 122, Londinium had reached its first peak. Much of Londinium’s story is told through its archaeology. Consequently this tour focuses on a number of places where important archaeology can be seen by the visitor. Please go to What’s On? to see whether this tour is currently on offer, and for booking details. MEET: in the porch of St Magnus Martyr Church, Lower Thames Street EC3R 6DN (take the Fish Street Hill exit from Monument Underground Station). Subscribe to get regular Charnowalks news!